As a reminder, starting tomorrow Case and Point will be live at the 2011 NHL All Star Game in Raleigh! Follow the Case and Point Twitter feed for behind the scenes pictures from the trip from Charleston to Raleigh and shots of your favorite players! Like us on Facebook to be the first to find out about the newest updates to the blog and watch for plenty of entries coming over the weekend including interviews with the biggest stars of the NHL and more! 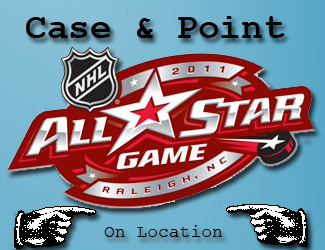 It's Case and Point LIVE from the 2011 NHL All Star Game in Raleigh! All this weekend!